Running thousands of state government programs in the Commonwealth of Kentucky means generating tons and tons of paper. 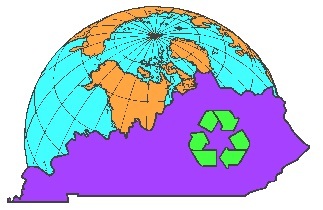 The Kentucky Government Recycling Section (KGRS) State Office Paper Recycling Program works hard to make sure as much as possible that paper generated by state gets recycled, saving landfill space, recovering costs and making sure sensitive documents are destroyed in a secure manner. The KRGS recycled 2,523,469 pounds of paper and cardboard in 2015. The program has recycled 41,367,295 pounds since January, 2002.
in 2015, 4163 cubic yards of landfill space were saved by recycling the paper and cardboard That adds up to 68,256 cubic yards of landfill space saved since 2002. The program was started in 1982 with one person, a small office and a Chevy Luv truck. KGRS currently has eight full-time staff and three temporary employees. The program shreds millions of documents every year that include the Executive, Legislative and Judicial branches of state government as well as, city and county government agencies in the Commonwealth. In this month’s edition, you’ll find news about declining recycling numbers in several major categories and increasing numbers for paper exports. Grant fund recipients are announced and the recycling market prognosis is examined. All that and more in the January edition of the Marketplace.